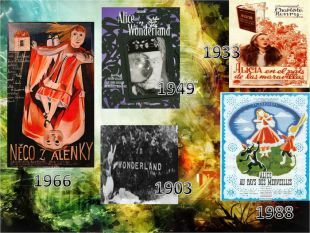 Презентація передає основні сюжетні особливості інтерпретації у сучасній філології. 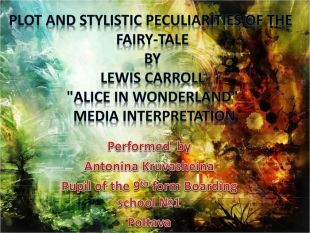 В останні роки помічається підвищення інтересу до даного феномена як з боку зарубіжних так і серед вітчизняних науковців. 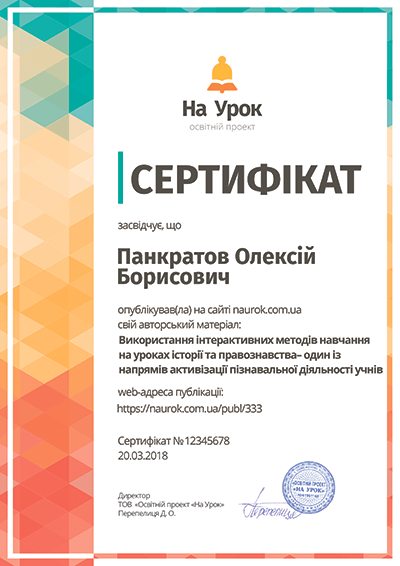 Підготовлена для захисту наукової роботи та використана на уроці. 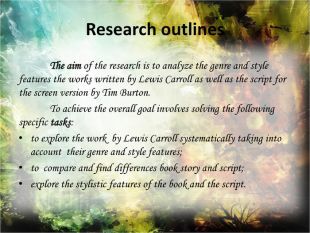 Research outlines	The aim of the research is to analyze the genre and style features the works written by Lewis Carroll as well as the script for the screen version by Tim Burton. To achieve the overall goal involves solving the following specific tasks:to explore the work by Lewis Carroll systematically taking into account their genre and style features;to compare and find differences book story and script;explore the stylistic features of the book and the script. Main features of the research	The subject of the research is genre - stylistic features of the book L. Carroll "Alice in Wonderland" and the movie script. 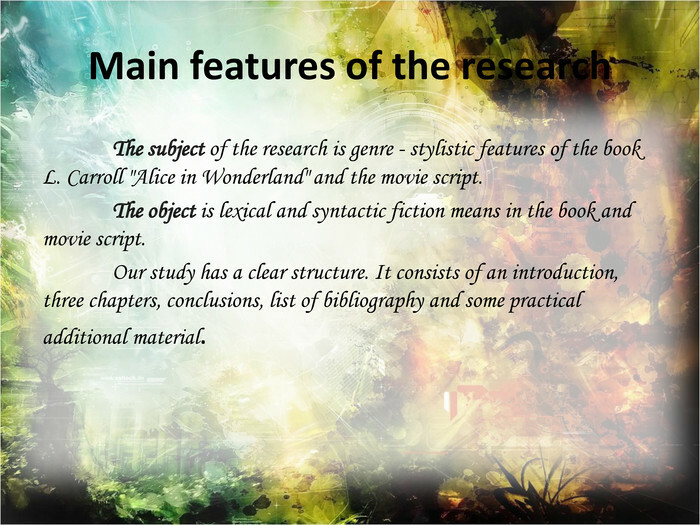 The object is lexical and syntactic fiction means in the book and movie script. Our study has a clear structure. 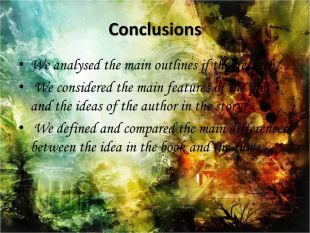 It consists of an introduction, three chapters, conclusions, list of bibliography and some practical additional material. 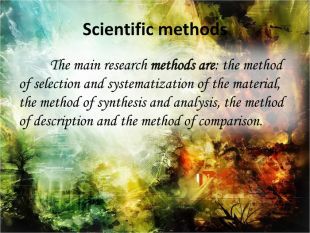 Scientific methods	The main research methods are: the method of selection and systematization of the material, the method of synthesis and analysis, the method of description and the method of comparison. 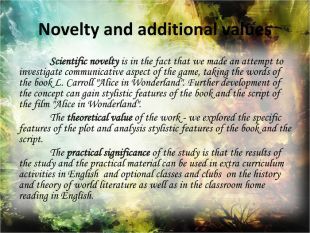 Novelty and additional values Scientific novelty is in the fact that we made an attempt to investigate communicative aspect of the game, taking the words of the book L. Carroll "Alice in Wonderland". 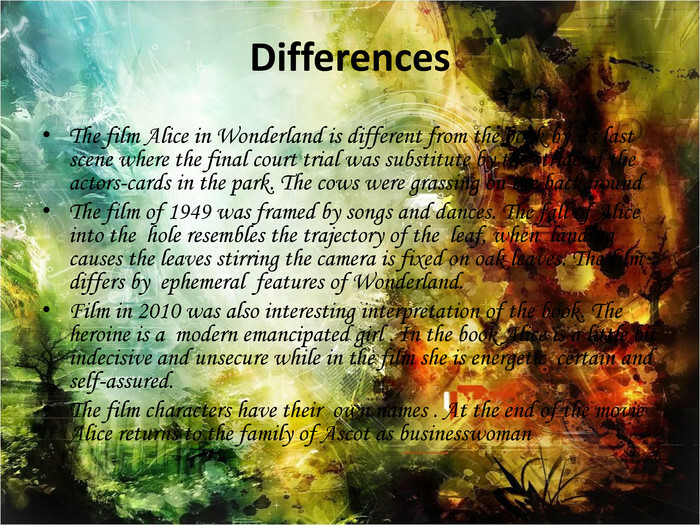 Further development of the concept can gain stylistic features of the book and the script of the film "Alice in Wonderland". 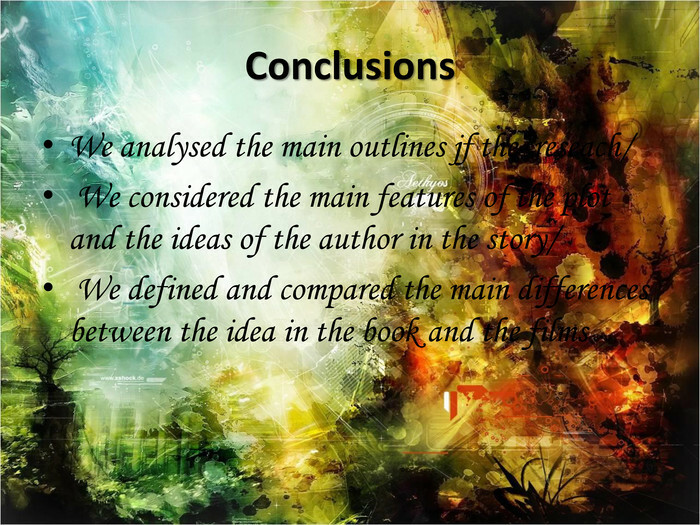 The theoretical value of the work - we explored the specific features of the plot and analysis stylistic features of the book and the script. 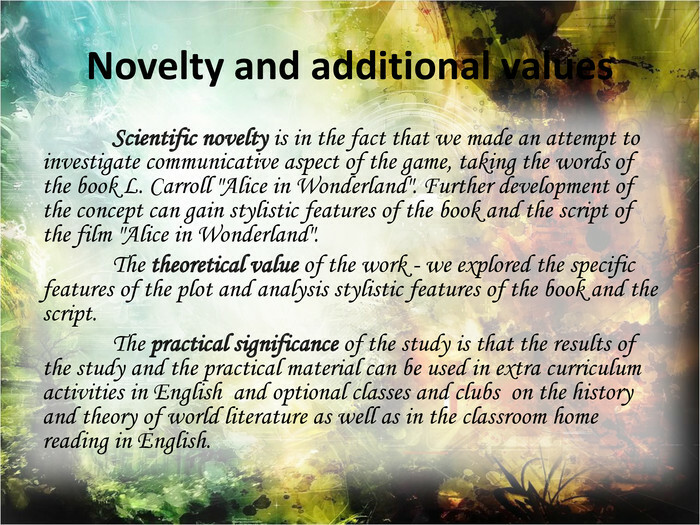 The practical significance of the study is that the results of the study and the practical material can be used in extra curriculum activities in English and optional classes and clubs on the history and theory of world literature as well as in the classroom home reading in English. Lewis Carroll (27.01.1832 - 14.01.1898)	Lewis Carroll (real name Charles Lutwidge Dodgson) was a remarkable English writer, mathematician, philosopher and a deacon. 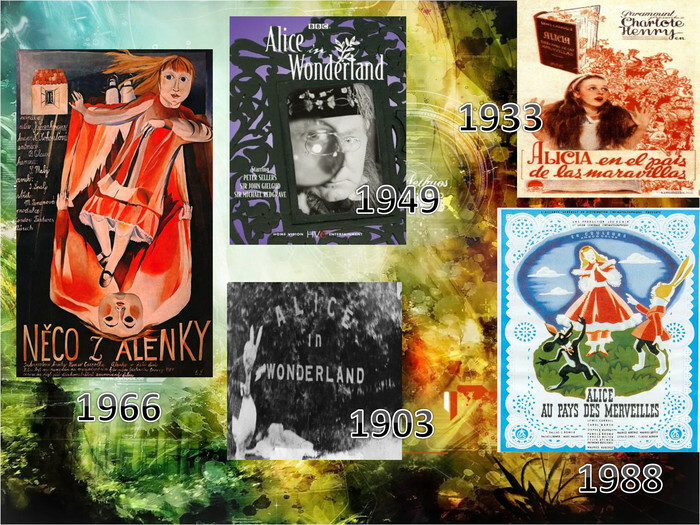 One of his lifetime passions included photography. 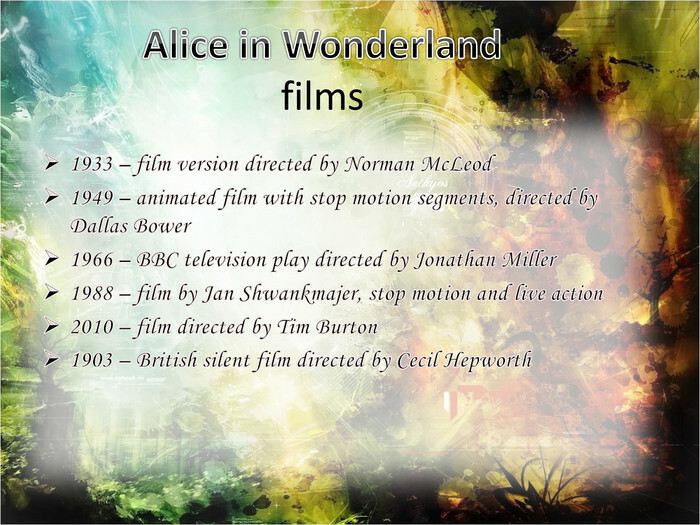 His most famous works is the fairy-tale “Alice’s Adventures in Wonderland”. The writer was born on January 27th, 1832, in Daresbury, Cheshire. His father was a parish priest. 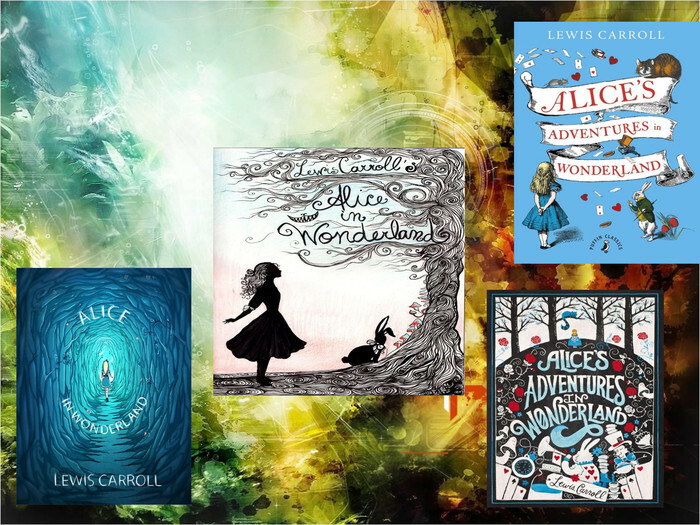 Charles had seven sisters and three brothers. 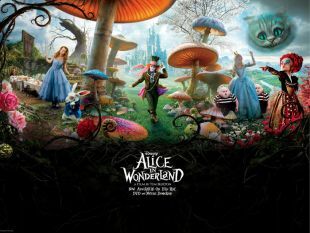 From the very childhood he showed himself as a clever and quick-witted boy. When he was twelve, he was sent to a private school near Richmond. 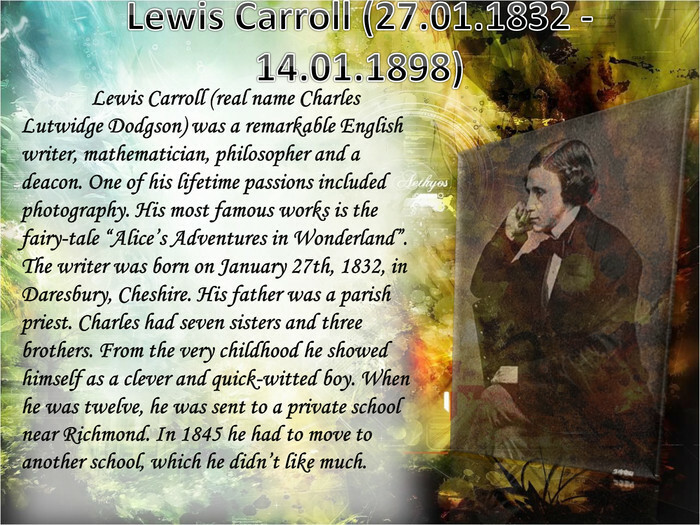 In 1845 he had to move to another school, which he didn’t like much. Alice in Wonderlandbook	Alice's Adventures in Wonderland (commonly shortened to Alice in Wonderland) is an 1865 novel written by English author Charles Lutwidge Dodgson under the pseudonym Lewis Carroll. It tells of a girl named Alice falling through a rabbit hole into a fantasy world populated by peculiar, anthropomorphic creatures. The tale plays with logic, giving the story lasting popularity with adults as well as with children. 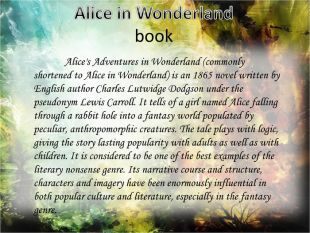 It is considered to be one of the best examples of the literary nonsense genre. 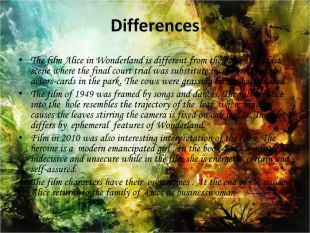 Its narrative course and structure, characters and imagery have been enormously influential in both popular culture and literature, especially in the fantasy genre.